This project for the renovation of an exhibition gallery in an active art school required the resolution of competing demands: the need for a clean, neutral space for the display of professional artwork, and the demands of the students and faculty who regularly use the space for critique, debate, and large-scale fabrication. Our strategy for this renovation within a 19th-century factory building was to selectively reveal the working history evident in the building, and then to build up a new set of surfaces suitable for the exhibition of art. Working in concert, the historic and the new reinforce the concept of a gallery as a place for the creation and discursive exchange of artistic work in its many forms. The first step included exposing original timber joists, heavy timber and steel framing, and cast iron columns. The second step manifested itself with the insertion of a plywood wrapper upon which two plaster display walls were hung, and which serve as the primary display surfaces. The plywood backing of the walls is expressed with an exaggerated thickness which contrasts with the lightness of the original cast iron columns while creating a cavity for the concealed routing of electrical cords required for exhibitions. 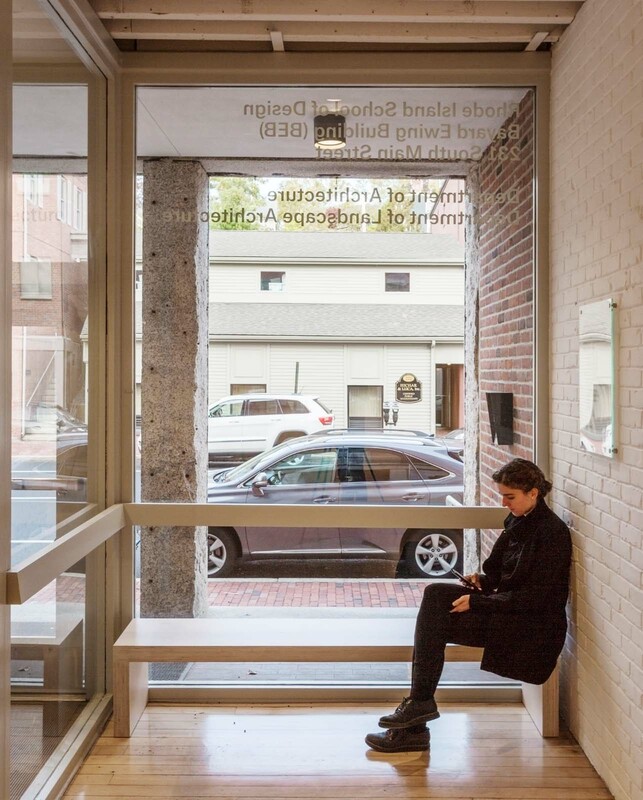 The project scope included the installation of a museum-quality LED lighting system, new built-in storage, and the creation of new building signage to announce the gallery’s presence to the street. Furniture pieces to complement the art display system were designed to allow visitors to rest in the storefront area.